You can feel the souls of the world's people and taste the richness of different cultures when you experience the art of Catalina Gomez-Beuth. Born in Medellin, Colombia, she studied Fashion Design. Her love for art was deepened during her stay in Florence Italy, while she studied Design. However, her true passion has always been painting. sensibility and became the foundation and inspiration to embark in the beautiful journey called Raizes / Roots – one of her current series. 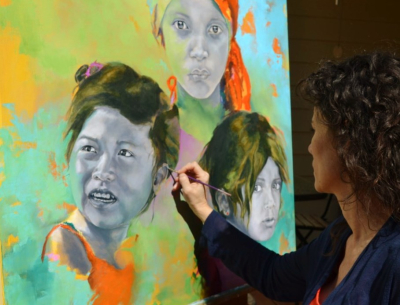 Catalina narrates through brush strokes in people’s faces the individuality, avoiding the boundaries created by skin color and emphasizing the gestures of the subject surrounded by vibrant tones inviting the viewer to discover the thoughts and emotions embodied in each canvas.